Gender is touched upon in one way or another in many of the testimonies. Men are still seen as heads of the household unless the woman is widowed or divorced. Many assert that machismo and the double standard still prevails. As one woman says, "men can do what they want and it doesn't matter. For example, if they get drunk, it's not seen as bad. A drunk woman's a lost woman. A single mother's disgraced all her life. The men have children all over the place" (Peru 6). Nevertheless, many acknowledge that there is greater equality nowadays. Educational opportunities are no longer routinely denied to girls, although one woman says that in the countryside they don't always take advantage of education: "They're not so bothered and many young girls give up going to school. Some content themselves with learning how to read and to write, just the minimum, no more - to add up, to sign their name, but that's all" (Peru 2). Women still rarely hold positions of authority. There are taboos against them working in the mines, but several narrators have worked effectively in the union (for example, in women's committees which have helped miners fight for better working conditions) and in other welfare organisations. As one woman said, "The women organised themselves out of necessity and conviction, and they knew why they participated" (Peru 24). Women are also involved in the Agrarian League and in mother's clubs, giving talks on nutrition, family planning and so on - responsibilities which fit more easily with the traditional role of carer. Some women take on work, such as knitting, to increase the family income but tend not to see these as "jobs"; rather as just helping out the family. Women in the rural areas play an active role in farming, but for those in mining camps, opportunities may be more limited: "They're mainly concerned with the house and the children. There isn't much else for them to do. Sometimes the companies organise clubs. When the [mining] company is in the city like la Cerro or La Oroya it's different...there are more activities, the women are organised and they work with the unions..." One woman spoke of her work to help women in these camps and her role in the union's fight for improved working conditions: "Threats would arrive every moment, either from the company, either from Shining Path. But instead of being cowardly or running away we worked even harder with the Support Committee.Then we made mining schools for the miner's wives in all the camps... despite all the difficulties, we confronted the company behind, behind all of those who were leaders. We were a very united group of wives that worked at the level of the Support Committee" (Peru 21). ".people [may] live as husband and wife, [but] the head of the household, head of the home, head of the family is the man. But there are women who have divorced, women who live as if they were single; there are also widows, and they certainly have to stand on their own two feet as individuals..; they have the same rights, the same qualities and the same duty to contribute to the community and be comuneras, members of the community. But if a woman is married, she and her husband cannot be comuneros because they'd otherwise be taking up more space, more land, more animals and more benefits. That's why, whilst they live as man and wife, it's the man who is the comunero..."
".me? [I studied] just until second year of primary, that's all. then my brother came along and they took me out of school, preferring to pay for my brother as he was the boy. Yes, they told me that's enough for you. You're a woman, you have to get on with your life now.at least you can sign your name and you've learnt how to read. this was what the older people thought: men ought to study more than the women because they would be the ones who worked and become heads of families and the community." "They used to say, what's the point in daughters studying when girls weren't going to contribute[economically] to the household...when they get married, they'd go on to serve their husband and his family - that's the way it used to be. [now there are] equal opportunities for studying: young men and young women both study.for as long as they want to and for as long as their parents can afford... This has changed drastically, almost 100%." ".there hasn't been a single woman on the governing board of the community, just men, that's all. Women tend to have other responsibilities, like the Vaso de Leche, for example. That's more likely. [Why?] I don't know. But I think it's a well established custom. Women do other jobs, don't they? The work in the house, children, babies.I think that's why...it's a custom... I think it should improve. But women need to prepare themselves better, even better than the men, or [at least] equal [to them]." "They say that if a woman goes into the mine there'll be a tragedy of some kind, that's what they believe ... that's why it's forbidden, they say it'll cause a disaster, deaths, cave-ins and all that. So don't even think about that, it's not possible. My dad says it comes from the pachamama tradition (mother earth). She doesn't allow women to enter her. 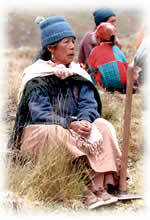 If a woman goes into a mine she's going into her bowels and this infuriates the pachamama, so my father says." "Cooking, washing and ironing, this, young man, this is the life for a woman now.When you look for a wife you're not only going to look for someone for the bed, you have to look for someone to iron, to wash, to make sure they can sew. Although you might not wear knitted socks now, she's going to have to mend your trousers when you get a hole, she's going to do the ironing. This is the work of a woman right till the end."